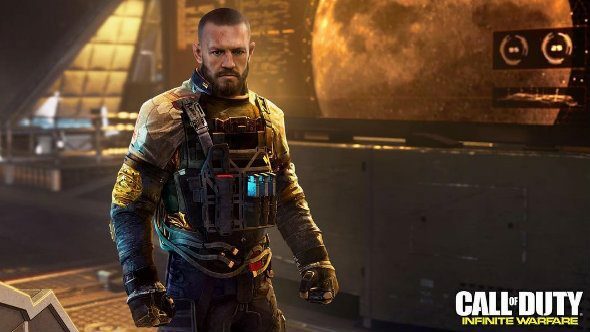 UFC superstar Conor McGregor is playing a character in Call of Duty: Infinite Warfare, taking the famous person spot previously filled by Kevin Spacey and NFL running back Marshawn Lynch. This year’s shooter war is heating up, but check out our list of the best FPS games for some all-timers. No doubt McGregor will be a force to be reckoned with in Infinite Warfare – I mean, in space you’re completely weightless, so he doesn’t have to worry about taking on any bigger lads up there. Hopefully none of the space soldiers catch him in a rear-naked choke after he punches them in the face 100 times. Let’s be honest, though – the only guns he’ll be needing in this fight are actual guns, not his biceps. Saying that, it’ll be a bit of a wasted opportunity if he doesn’t batter a few folk with his speedy standup game. Mind you, he’s just as fast with his mouth. Prominent voice actor Nolan North responded to the news in a tweet, joking, “I wanted to do this awesome looking game, but @TheNotoriousMMA beat me out”. The name of McGregor’s Infinite Warfare character was not announced, and we don’t know how big his part is, but it looks like there’s more to come tomorrow. Personally, I hope it has him swearing at your enemies all the way through. In fact, I hope there’s a button to make him swear, 50 Cent: Blood on the Sand-style.